Rice bran and olive oils both have much to recommend them. Olive oil has enjoyed a longer run of popularity as a healthy source of monounsaturated fat, but rice bran oil offers some compelling benefits too, such as its claim to fame as a multi-use hypoallergenic oil. Both oils have a place in the pantry of those seeking healthy options. Rice bran oil beats olive oil in its vitamin E power, as it contains both the tocopherol and tocotrienol forms of the vitamin, whereas olive oil contains only the tocopherol form -- and less of that than rice bran oil. Additionally, rice bran oil contains significant amounts of the antioxidant oryzanol, whereas olive oil has none. Olive oil, however, contains more of the health-enhancing antioxidant known as DHPEA-EDA, known for its heart-protecting capacity. Lowering cholesterol is a possible benefit of adding rice bran oil to your diet. A May 2005 animal-based study published in the journal "Food and Chemical Toxicity" reported that total cholesterol levels dropped significantly -- including a 62-percent decrease in "bad" cholesterol -- when antioxidants from rice bran oil were added to the diet. 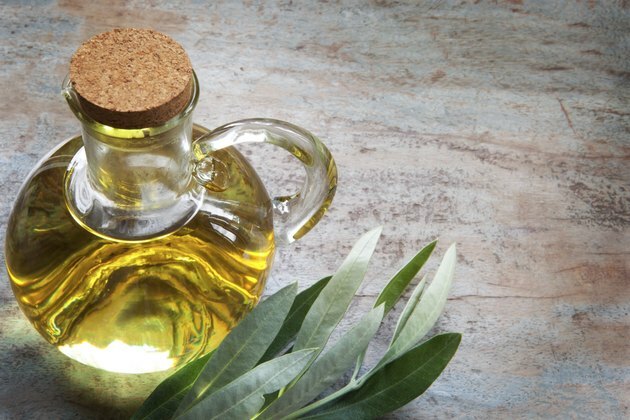 Comparable research on olive oil suggests that a diet that replaces butter or margarine with a monounsaturated fat source like olive oil correlates with lower blood pressure and a lower risk of cardiovascular concerns, according to a 2005 study published in the the "Journal of the American Medical Association." Olive oil shows modest potential for lowering the risk of breast cancer, but further studies are needed. When choosing a cooking oil for a dish requiring high heat, rice bran oil may be the better option; it has a smoking point of 490 degrees Farenheit, verses 360 degrees for olive oil. This means the important nutrients such as fatty acids will not break down as quickly during the cooking process and will retain their nutritional value. Rice bran oil has a long shelf-life due to its particular blend of components. Olive oil, on the other hand, is more delicate. You can refrigerate olive oil to prolong its shelf life. Both oils are high in calories and best used in moderation. Rice bran is lower in monounsaturated fats, or "good" fats, than olive oil and is not as readily absorbed into foods during the cooking process. Science Daily: Can Rice Bran Oil Melt Away Cholesterol?